Let’s face it; we are living in a time of economic uncertainty and tragic failures providing victims proper care and response in the face of disaster. We have seen the level of damage and emergency response with Hurricane Katrina and Hurricane Sandy. This disaster taught us that we cannot rely on help reaching us in a timely manner (if at all) from our government, or its agencies for these types of disasters. More and more people are seeking ways to be more self sufficient in surviving disasters. This has been a personal concern for some time and I have become much more aware of the things we need to do in order to look after our families. Planning ahead is going to be the key to readiness. Food and water after any disaster is critical, but often times not available in the disaster zone for long periods of time because of hording, poor response from emergency agencies, and possible contamination of supplies on hand. It’s become very popular to be educated on survival techniques and long term food storage. As an Entomologist I am aware that just having these supplies isn’t a guarantee that the quality of the food will be in a usable state when it is needed. I’ve seen my share of Stored Product Pest damage and the Millions of dollars it cost the manufacturing companies it affected over the years. So knowing the potential damage it can cause to a survival program, I wanted to offer some storage practices that can help mitigate inventory loss. Facts: About 80% of human food comes from grains, such as barley, corn, millet, rice, rye, sorghum, and wheat, and legumes, such as beans, soybeans and peanuts. All of which are great to have in a survival program. 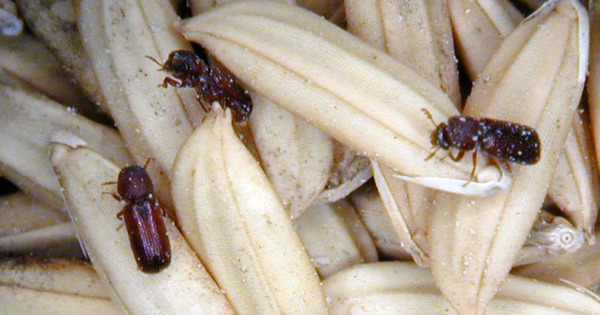 Loss of product comes from two sources, (1) the actual consumption of grains form insects and rodents. (2) Contamination and damages to structures or containers by poor storage and/or rodents and insect activities. Indirect contamination also can be from those from which result from dry and wet grain heating, moisture migration, bacteria, fungi, aflatoxins, and parasites of humans. Stored Product Pest can already be in your food when you purchase it. I know this is scary, but many of the flour and grains have eggs in them and can hatch at any time depending on moisture and temperature. It’s always best to keep each item separate form others so if a product does hatch you will not contaminate your entire supply. This is where you need to have a regular inspection of all storage. Placing everything into a sealed drum isn’t your best option here. Out of sight, is out of mind and you will not likely be happy when you do open it. Pest won’t hatch out if you are able to keep in the refrigerator or better yet in a freezer. I know not everyone has room, but having a spare freezer or refrigerator in the garage is a good investment. External threats are also a concern with long term storage. Rodents are probably going to be your biggest concern because they can chew through just about every container material there is. Metal drums that have a removable ring on the top is a good start. Access is a key issue so choose a place that will be secure and available when you need it. Monitoring your products on a regular basis is going to be key in the quality of your survival food. There is Stored Product Pest pheromone traps available from the Internet that can be used to “sample” the storage area that you choose to keep your food in. Also, if you choose your garage, be sure that your total storage isn’t going to cause an access issue if you have a major earthquake, you don’t want your food to be buried under Aunt Edna’s collection of glass wear.